Usually mentioned in my blog, diversifying by industrial sectors is one of the most intelligent ways to manage a portfolio of investments in shares. The Global Industry Classification Standard (GICS) is the one that defined the 10 existing sectors and groups, which today are 11 since a couple of years ago, Real Estate was added. Standard & Poor, creators of the main stock market index of Wall Street SPX, manages the most popular funds in the world based on industries, which appear in the following table. Take into account: Technology and Health are the most capitalized industries in the US. - The "offensive" sectors (bullish, aggresive) are: Financial XLF, Technology XLK, Materials XLB, Industrials XLI, Discretionary XLY. - The "defensive" sectores (bearish, safe) are: Staples XLP, HealthCare XLV, Utilities XLU. - I consider "neutral" sectors the Energy XLE and Materials XLB. Some economists think differently, and consider them slightly offensive. The most useful thing of the classification by sectors is to use its relation with the economic cycle (expansion or contraction), to determine which are the predominant sectors, and to look for companies to trade there, reducing the possibilities of loss. Another option is to trade "to the same sectors" through the S&P indices indicated above, as they are ETF (by definition, exchange-traded fund, a marketable security that tracks an index, a commodity, bonds, or a basket of assets like an index fund). The advantage here is that as they are sectors, and cyclical, they lend much better to technical analysis than a particular company. The theory mentioned above is called Sector Rotation, and can be better understood in the following graph, taken from StockCharts.com, where we see how some sectors behave better than others according to the economic cycle. The green line is the economic cycle, the red one the market. 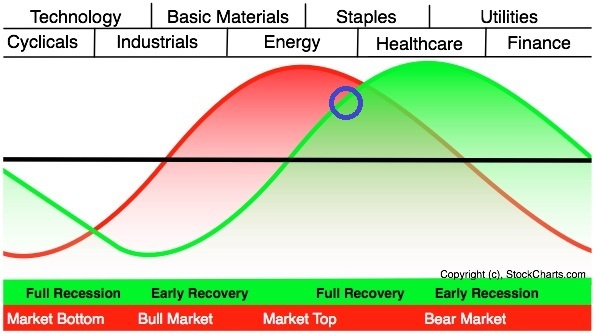 Top: the sectors that best they behave according to the cycle. The intermediate line divides the economy into expansion and contraction. The blue circle is explain below. - See how the market anticipates the economic cycle. - Finance, Technology and Cyclicals (or Discretionary) are sectors that behave better in a market bottom or in an economy in recession. - Energy and Materials lead when the economy is at its highest point, favored by the rise in commodity prices and high demand. - This is where the early recession comes from and the FED lowering the interest rate to stimulate the economy in its arrival to an upcoming recession. And the cycle repeats ad infinitum. All of the above is theory, paper, reality always has its differences. 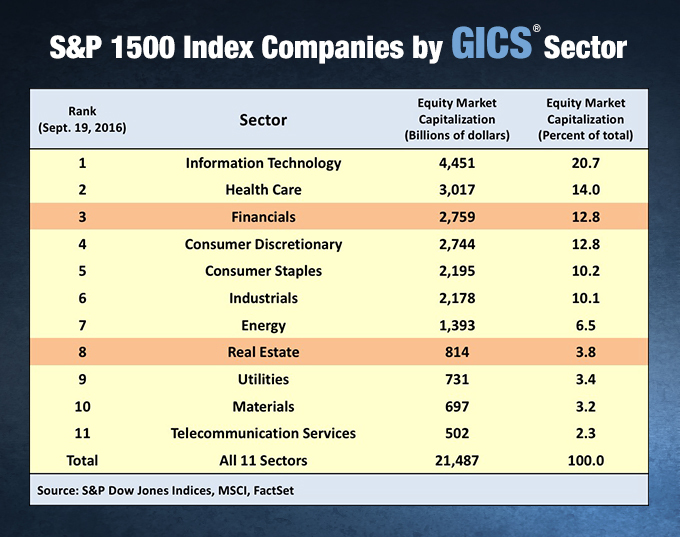 And how are the sectors doing this year? I elaborated the following chart, using a timeframe of 9 months, beginning in january 2018, to establish a comparison between the 9 main sectors to determine which is behaving better, and in which cycle the economy is now in the US. Comparison charts of the performance of the main 9 sectors during 2018. Shadow in grey is the SPX, the benchmark. Five sectors are above it: XLE, XLY, XLV, XLK and XLU. The lower histogram shows the "Sector Rotation Model SRM" an attempt to integrate fundamental approach into a technical indicator. It is based on a premise that macroeconomic sectors behave differently in certain phases of uptrend and downtrend. , Since July 15th. the plot is green above zero, that signifies the market is in a uptrend.